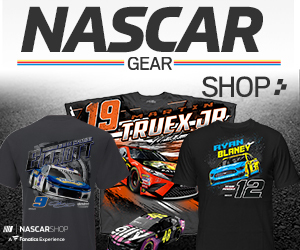 HAMPTON, Ga. – In a wild race that saw some of the best trucks in the field destroyed before the finish, John Hunter Nemechek held off Cameron Hayley in a two-lap dash to the checkers to win Saturday’s Great Clips 200 NASCAR Camping World Truck Series event at Atlanta Motor Speedway. But it was a skull session with 2014 Sprint Cup champion Kevin Harvick the night before that was instrumental in guiding Nemechek to victory in his unsponsored No. 8 Chevrolet. Obviously, the lesson paid off. After extensive cleanup from Christopher Bell’s hard crash into the Turn 4 wall, Nemechek chose the inside line for a restart on Lap 199 of 200. When John Wes Townley spun his tires in the outside lane, Nemechek pulled away to beat Hayley to the stripe by .305 seconds. The victory was Nemechek’s second in 32 Truck Series starts and his second on a 1.5-mile intermediate speedway, the first coming last year at Chicagoland Speedway. 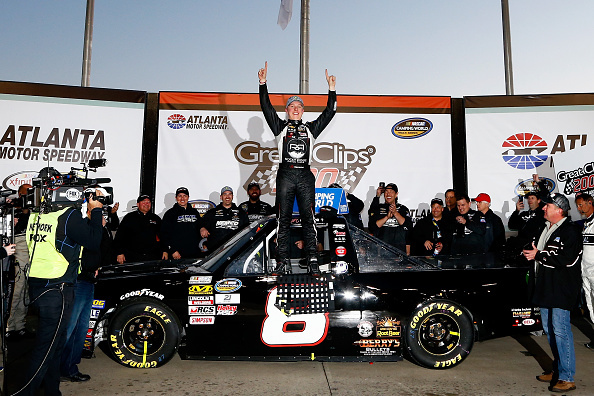 At 18 years, 8 months and 16 days, Nemechek is the youngest NASCAR national series winner at Atlanta. Before the family-owned team with a shoestring budget could get to Victory Lane, however, attrition took care of the drivers who led the majority of laps leading up to the finish. Two corners after a restart on Lap 112—following the race’s second expiration of the 20-minute caution clock—Bell lost the nose of his No. 4 Toyota, hooked Kyle Busch Motorsports teammate Daniel Suarez’s No. 51 Tundra and turned Suarez into race leader Matt Crafton, who had spent 76 circuits at the front of the field. The trucks of Crafton and Suarez were damaged beyond repair, leaving Bell, who lead 42 of the 130 laps, to grab the top spot after the subsequent restart on Lap 116. Bell pulled away, but on Lap 123, a tire rub resulting from the earlier contact finally popped the right front, and Bell’s Toyota swerved straight into the outside wall in Turn 4. Behind Nemechek and Hayley, Timothy Peters came home third, followed by Daniel Hemric and Grant Enfinger. Nemechek was circumspect about the circumstances surrounding his conversation with Harvick, but the information he received was clearly valuable. Nemechek also got advice from his father and team owner Joe Nemechek, who won a NASCAR XFINITY Series race at Atlanta in 2001. Eighth-place finisher Parker Kligerman took the lead in the series standings by one point over Hemric and three over Nemechek. 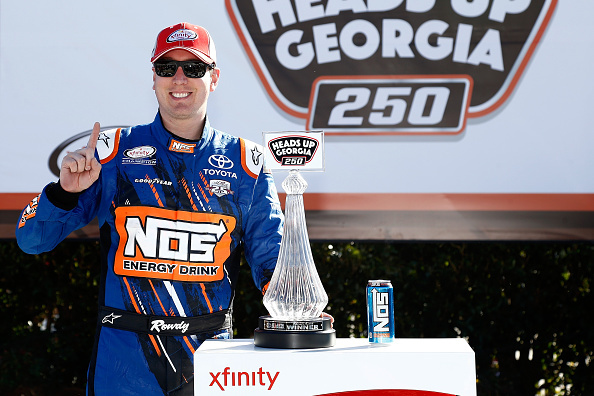 The afternoon proved expensive for Kyle Busch, who as a driver won the first leg of the Saturday doubleheader in the XFINITY Series race, only to lose three trucks as an owner in the nightcap. In addition to the wrecked trucks of Bell and Suarez, Busch also had to write off the engine of William Byron, which blew on lap 59, with Byron running second. 1. (18) John H Nemechek, Chevrolet, 130. 2. (5) Cameron Hayley, Toyota, 130. 3. (12) Timothy Peters, Toyota, 130. 4. (9) Daniel Hemric, Ford, 130. 5. (4) Grant Enfinger #, Chevrolet, 130. 6. (7) Ben Rhodes #, Toyota, 130. 7. (2) John Wes Townley, Chevrolet, 130. 8. (17) Parker Kligerman, Ford, 130. 9. (25) Caleb Holman, Toyota, 130. 10. (11) Spencer Gallagher, Chevrolet, 130. 11. (27) Rico Abreu #, Toyota, 130. 12. (23) Austin Hill, Ford, 130. 13. (22) Tyler Young, Chevrolet, 130. 14. (21) Tyler Reddick, Ford, 130. 15. (10) Ben Kennedy, Toyota, 130. 16. (20) Austin Wayne Self, Toyota, 130. 17. (6) Cole Custer #, Chevrolet, 130. 18. (19) Garrett Smithley(i), Chevrolet, 129. 19. (24) Brandon Brown, Chevrolet, 128. 20. (8) Ryan Truex, Toyota, 127. 21. (30) Timmy Hill, Chevrolet, 127. 22. (14) Justin Marks(i), Toyota, 127. 23. (29) Travis Kvapil, Chevrolet, 127. 24. (26) JJ Yeley(i), Chevrolet, 125. 25. (28) Tommy Joe Martins, Chevrolet, 125. 26. (3) Christopher Bell #, Toyota, Accident, 122. 27. (31) Carlos Contreras, Chevrolet, 122. 28. (16) Johnny Sauter, Chevrolet, 121. 29. (32) Jennifer Jo Cobb, Chevrolet, 120. 30. (1) Matt Crafton, Toyota, Accident, 111. 31. (13) Daniel Suarez(i), Toyota, Accident, 111. 32. (15) William Byron #, Toyota, Engine, 59. Average Speed of Race Winner: 121.15 mph. Time of Race: 01 Hrs, 39 Mins, 09 Secs. Margin of Victory: 0.305 Seconds. Lap Leaders: M. Crafton 1-6; C. Bell # 7-25; M. Crafton 26-91; C. Bell # 92-107; M. Crafton 108-111; C. Hayley 112-115; C. Bell # 116-122; J. Nemechek 123-130. Leaders Summary (Driver, Times Lead, Laps Led): M. Crafton 3 times for 76 laps; C. Bell # 3 times for 42 laps; J. Nemechek 1 time for 8 laps; C. Hayley 1 time for 4 laps. Top 10 in Points: P. Kligerman – 55; D. Hemric – 54; J. Nemechek – 52; T. Peters – 49; T. Young – 47; R. Truex – 45; B. Brown – 43; B. Rhodes # – 43; G. Enfinger # – 42; J. Sauter – 41.